#44: Goa: and exhale. The Curious Incident of the Gap in the Year. The bimonthly travails through life; sometimes avoiding the pointing fingers and arrows of outrageous fortune. We have set off from Agra en route to catch a plane to Goa, via Delhi. We have a driver and arrive just after midnight at large chain hotel right next to the airport; only seven hours before we have to get up to catch our flight. I go in with the boy and enquire about a room for all four of us for just the few hours. The female receptionist suggests the equivalent of about £50. I tell her we are not paying that for a room where we will only sleep for a few hours, seconded by the boy. She reiterates the price is not negotiable and her look seems to suggest we are not haggling in flea market, and she has a very important role within the top-end hoteling company. I tell her thanks, but no thanks, we have a driver and we will find somewhere cheaper. We are about to get in the taxi, having explained the situation to the others when the receptionist runs out flustered and says, ‘Ok, you can have it for £22.’ We decline, as the driver knows somewhere decent for half the final offer. We are embracing the culture, we are not all ‘family-toileting’ in a field together yet, and my aphorism of, ‘We have nothing to do, and all day to do it’ is a massive factor, and in this particular instance, having the luxury of a driver also helps. I had an enquiry last week to ask where we got the money from for this year off. We had a house in the Shadow of the Kippax, (Man City’s old ground) that we lived in–the girl was born in the same house, we rented it out when we moved. It became a lot of hassle renting to cash-strapped students and we sold it. With the proceedings, (£40,000), we should have maybe done something sensible and paid off a chunk of our mortgage, but instead we blew it all on investing in memories that will keep us warm when our knees and bladders have given up. The sub-text of the email was, ‘are you stinky rich, so you could give your jobs for a year?’ The answer is quite simply: ‘no’, but even coming from working class backgrounds, the wife’s was much further down the socio-economic rung to mine, education was, and still is for nearly all of us, except the minute, minute, lucky few, the key. The boy learns that something is only worth what someone else is prepared to pay for it, but that price should not leave one/or either party unable to survive. Like his mother always says, ‘I’d rather pay more and know people are not being ripped off’, but that’s a luxury only available to some, and even those it is available to, greed can often cloud the vision through their moral googles. What might look like ‘healthy capitalism’ on the horizon; is in fact voracious gluttony come what Fannie Mae, at any cost. We are waiting at the luggage carousel, the airport is heaving, and there are several officials standing around in pairs or individually. I decide to ask a lone individual where I might possibly get my knife back. He looks belligerent and uninterested in the world in general, propping a wall up and waiting for his pension. I walk over to him and he eyes me up and down as I walk over, as if I’m a subordinate monkey come to take on a much bigger and strong alpha male or cuckold one of his harem. I start to explain assuming he can speak English: “I handed a knife in in Delhi, do you know where I might get it back from?”He adds withering to his belligerence and without taking his eyes from mine he places his left hand in his pocket and pulls out my shiny red multi-gadget with embossed white cross. My eyes light up, this is the best magic trick I have ever seen, this makes all those street magicians look like an eight year old that has just be given a magic set for Christmas. I literally cannot believe my eyes, he passes it to me without a word, and I go off to tell the wife about this miraculous event as she is still waiting for our worldly possessions that now compactly fit into four travel cases. She is the first to be unimpressed with my regaling of the story as she is wrestling one of the kid’s cases from the carousel, but she won’t be the last. It is what religious people would call a ‘miracle’, and I have heard believers state far less spectacular occurrences as such. 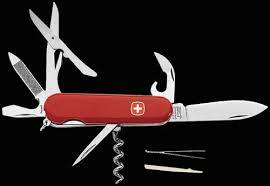 I call it the parable of the lost Swiss army knife. But my journal simply states: ‘I had my Swiss Army Knife confiscated, but it was given it back in Goa Airport.’ In the King Charles version after my gospel has been ‘lost’and reinterpreted it will be a much more impressive parable with a very powerful moral ending, and involve killing, forgiveness and redemption. I still have the beloved knife and it lives in my wash bag. Its sole function appears to be cutting the tags off new clothes! As the Lama might say after good chicken curry: ‘stuffs just stuff, it won’t make you any happier, just take up more space in your life, i.e. your wash bag.’ Then after greater thought following a particularly juicy lamb chop: ‘Have you thought about those tiny travel scissors you can ‘borrow’ from hotels?’ This is why he is so learned. We were heading to Goa to stay with an English travel agent, Eddie and his wife, whom we had befriended in on safari in Ramthambore. 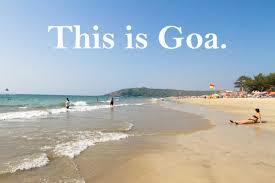 He rented a large Indian house, along with a Goan family, set back from the beach. Once he told us there were two separate rooms, we were sold. Having at least one of the children in the room with us, especially sometimes when the girl slept in the same bed as us, is a pretty effective contraceptive. This is one drawback having your children with you on your travails. There are moments when the sun is bouncing off your pineal gland and you are reduced to discrete body language towards the one you love/desire; that is not dissimilar to a gay-sauna liaison. This usually happened when the kids were happily playing in a pool, how apt. The kids were a little disappointed that the house did not run directly onto the beach, but it was a proper south Indian house; large swaying coconut trees, sandy open back courtyard, in which they burnt coconut husks at dusk to keep the mosquitos away. When people say that you cannot consider India as one country, just a collection of smaller ones; walking down the thick sandy beach towards Calangute, it is a long, long way from the much of the bustle we encountered in the north. From that first night in Delhi when our daughter was freaking out as we were greeted by rabid dogs outside the airport, children begging in the street and lizards climbing the guesthouse wall. This was the first time it felt like a holiday within a holiday, the reward for ‘The North.’ Like I have said before, if you are intending to travel a large portion India start in the north and finish in the south. 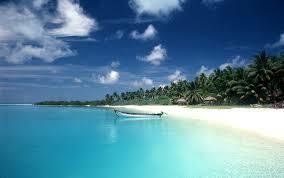 It is much easier coming from the ‘stress’ of our everyday lives’ to end the holiday on a beach. I imagine that even in the few years since we were there, mass-tourism has mutated in Calangute and the surrounding coastal villages, now the back-packers with residual hippy tendencies will have moved elsewhere. One this occasion the waiter replied with a friendly but casual affirmative. Neither of the children believed it, a tourist lie, but the proof of the pudding was in the eating. 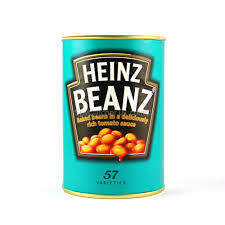 So with a little more than a collection of tinned haricot beans in a secret over-sugary tomato sauce, both children were ‘happy’, sometimes, it’s just the little things in life. Next time: Putting the para in paradise.